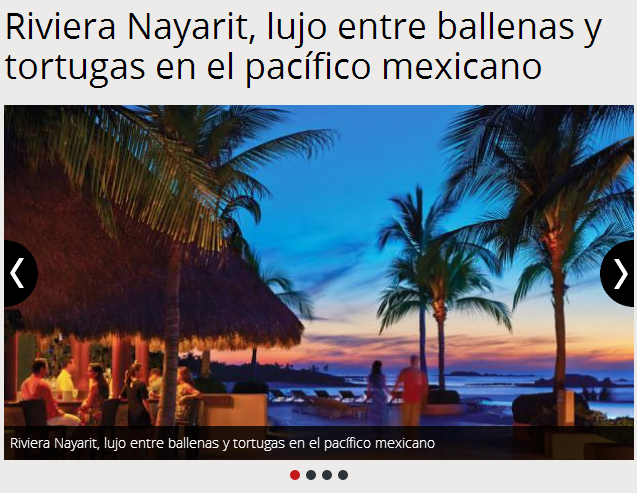 Thanks to the six journalists invited on a FAM trip by the Riviera Nayarit CVB there are now articles being published in the most important media in Cali, Medellín and Bogotá. The perseverance of the Riviera Nayarit Convention and Visitors Bureau’s public relations office is already bearing fruit in Colombia, an emerging market that is of prime importance to Mexico’s Pacific Treasure. On this occasion, representatives from six of Colombia’s major media outlets had a chance to immerse themselves in the destination (the majority are from Bogotá, with a few from Cali and Medellín): El Tiempo, El Espectador, La República, Hola Colombia, Colprensa, El País and El Colombiano. The tour enjoyed by these journalists who are already publishing pieces on the Rivera Nayarit was quite extensive and in-depth. They were here from March 21 – 25 and visited the coastal towns and hotel developments of the region, seeing firsthand the synergy present between nature and luxury. The first article to emerge from the FAM trip was published in March by La República, with 170 thousand readers. If we add together the impressions displayed by each media they reach around a million readers, all of them potential visitors. “Each country has its uncharted landscapes lush with greenery, sunsets brilliant with colors and, every once in a while, sun, sand and sea. This is Mexico’s Riviera Nayarit, an undiscovered treasure that has yet to appear on the radar of millions of tourists who choose Cancún, Playa del Carmen or the Riviera Maya,” states La República. The Colombian publications speak of the whales, the turtles, the golf, the celebrities, the hotel accommodations, the surf, the art and the culture of the Riviera Nayarit. Thus the Riviera Nayarit has a constant presence in this Andean country, thanks to the promotional efforts together with the public relations representation the destination has in that market. Another plus: the excellent commercial relations the destination has with retail and wholesale agencies around the country, which are key to the development and growth of the Colombian market and to obtaining ROI within a shorter time period. Of course, the very real possibility of Avianca and Copa Airlines initiating flights to the Vallarta-Nayarit Airport is just as important; if they become a reality, the increase in visitors from Colombia can grow to become a full 2% of our tourism influx by 2015.